One of the most versatile and creative products in the makeup industry is eyeshadow. Eyeshadows come in singles, duos, trios, quads and more types of groupings. If you are looking for variety in colors, textures, finishes and forms, eyeshadow will fit the bill. Eyeshadow is still one of the most popular types of makeup purchased. With all of the different colors and types, you could change your look every day if you chose to. Knowing how to sort through the hundreds of different types of eyeshadow palettes can be very beneficial so you are not wasting time or money on substandard products. Finding the right eyeshadow palettes that are perfect for your skin tone, eye color and wardrobe can make you feel attractive even on days when you may wake up feeling less than energetic. These three top rated eyeshadow palettes have everything you need to create a multitude of different looks from casual to flashy. These eyeshadow palettes rated the highest in terms of variety of colors and finishes, wearability, high pigmented color, ease of removal and design as well. Eyeshadow is a popular part of the makeup process. This beautiful 12 color eyeshadow palette from theBalm has beautiful, satiny colors that can be layered or applied individuality. There is a range of colors in this palette that goes from light for breakfast dates or getting ready for work; all the way to the bolds which make the perfect eye look for dinner or dancing at night. These eye shadows will add definition and emphasis to your eyes in a subtle way that is noticeable. You can use them in combination with other colors as well or just choose your favorite and use that one. With theBalm NUDES eyeshadow palette, you can have your eyes looking their best and most beautiful effortlessly. Comes with an applicator. You’ll have 252 exceptional ways to make your eyes stand out with the Joly 252 Eyeshadow Palette. There is a huge range of colors including subtle nudes, rich blues, vivid pinks, right oranges, and smoky neutrals. These shadows have a combination of matte to super shimmer finishes to fit whatever occasion you are dressing up for. Each color in the Joly eyeshadow palette is highly pigmented, pressed eyeshadow powder that can be applied either wet or dry. Wear several colors together, layering and blending them for a stunning look, or choose just one. The Joly 252 collection is separated into three removable trays that fit into the included compact matte black case. These eye shadows offer the wearer all day wear, high color and definite ease of application. If you’re looking for eyeshadow that offers plenty of flexibility, look no further than SHANY. This eyeshadow palette offers 88 different colors ranging from a soft neutral to a retro metallic color perfect for going out on the town. 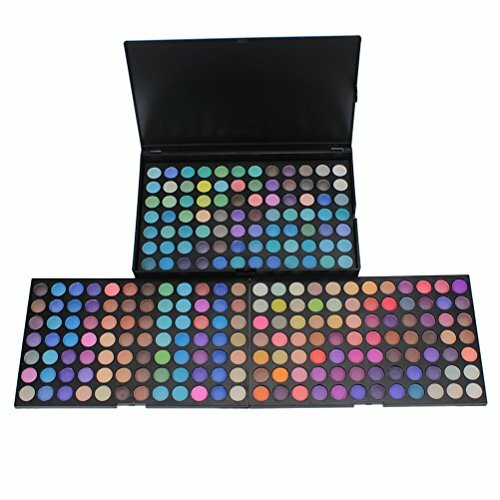 Included in this professional-like eyeshadow palette is a rainbow of greens, blues, violets, and metallic shades as well. The 11 rows of shadows provides the wearer with a complete array of colors to help create any look that is desired, whether you are getting ready for work, going to a job interview or going out on the town for a night of dancing and dinner. Regardless of the occasion, SHANY has you covered and you will look spectacular. No special makeup remover is needed to take SHANY eyeshadows off, just wash it off using your normal face washing routine. Every eyeshadow in this palette is made from natural mineral oil base that provides the wearer with a vivid shade that is highly pigmented. These eyeshadows are resistant to smudging and fading so you won’t have to reapply halfway through your day or night. The slender compact fits perfectly in your purse and organizes the colors from the smoky grays to the flashy metallics. The top part of the compact features a large mirror and two eyeshadow applicators. Wash off your SHANY eyeshadows easily using your regular face washing routine. This eyeshadow palette is designed in the USA and they are members of PETA as well. Eyeshadows have been used for centuries to enhance the beauty of the eyes and it is currently the most popular cosmetic product after lipstick. There are dozens of different eye shadow combinations on the market and trying to decide on the type and color can sometimes be a real challenge. Read our detailed buyer’s guide below to learn even more about eyeshadow palettes. We’ll provide you with the right information that you can use to narrow down the choices and find the right eyeshadow palette for your lifestyle, eye color and preferences. What is an Eyeshadow Palette? If you find that you have a hard time choosing the right eyeshadow palette and you have several little-used palettes at home because you don’t like how they look, keep reading. We’ll provide you with plenty of information for you to get the most out of your eyeshadow palettes and to create the looks that you will be proud to show off. There are several things to consider when choosing an eyeshadow palette. We have outlined these considerations so you can take them into account before you start the search for the perfect eyeshadow palette for your needs. Research the reviews – Customers are leaving about any eyeshadow palettes you are interested in. You can learn a lot about a product by reading what others have to say about it that have purchased it and used it themselves. Decide what kind of eyeshadows you want more of – Some people like the matte colors of eye shadow that are flat with no sparkle or shimmer. Matte shades are terrific for every day casual use. The metallics and shimmer colors are for nighttime looks although depending on the color and the way it is applied, you could wear shimmer during the day. What colors are the best? – A lot of this decision has to do with personal preference although different colors of eyeshadows can enhance the color of the eyes. The best colors to choose are the colors that you would wear every day. Many people choose a palette of colors that work for daytime and another palette of colors for nighttime looks. All three of the choices reviewed above have multiple colors to work with. The nudes of theBalm are perfect for workdays and daytime use. The other two choices have a large selection of colors that cover all looks. Choosing an eyeshadow palette doesn’t have to be difficult if you take into account your daily lifestyle, your eye color and the activities you like to do. Pay attention to quality – While it may b e really tempting to load up your makeup case with cheap eyeshadow palettes, there really is a difference in the color purity and wearability with the better quality makeup. This doesn’t mean that you have to choose the most expensive one, but you will notice the difference in color depth and lack of fading in the better eyeshadow palettes. There are a few questions you can ask yourself in regards to quality that will help you determine whether to choose a certain palette. These answers will possibly be answered in the review sections of the product or you can try it yourself and if you don’t like it, return it. Most cosmetic companies offer satisfaction guarantees that protect you against being stuck with a product you don’t like. Does the eyeshadow palette allow you versatility and flexibility in terms of application? Can you apply it in a more sheer way as well as adding more color when you want it? Will it have s smooth consistency when it is applied, regardless of the brush or applicator you use? Does it flake onto the face after you have applied it, especially if you have a high intensity job or situation you are engaged in? You want to choose eyeshadow palettes that don’t flake onto the skin around the eyes and that won’t fade into oblivion after you apply them. Ensuring that the eyeshadows you have chosen are good quality will also ensure that you will love wearing them and will use them often rather than purchasing them and letting them sit in a drawer. There are many different types of eyeshadows on the market today. Not just different colors but different forms of eyeshadow as well. It may be confusing to try and figure out what type of eye shadow you prefer with so many choices available. We have outlined the most common forms of eye shadow that you will encounter. Powder form – Powder eyeshadow palettes are very versatile and can be applied wet or dry. They can even be used as eyeliner with the proper brush and are very easy to apply. Pencil – If you are looking for detail, then you will love pencil eyeshadow palettes. They are very good for creating the popular “smudge” effect. Cream – Cream eyeshadow palettes can be difficult to use because they smudge very easily. If you already have oily skin or you have never worn eyeshadow before, you may want to avoid cream eyeshadows for one of the other choices. Gel – This type of eyeshadow is great for those with excessively oily skin. It is very long-lasting and doesn’t usually have to be reapplied during the day or evening once you have applied it. Mouse – This type of eyeshadow combines gel and powder but feels like cream eyeshadow. There are two important things to take into consideration when it comes to choosing the right color eyeshadow: your skin tone and your wardrobe. Eye color can be enhanced by certain colors as well. You don’t want to choose an eyeshadow the same color shade as your eyes. The best way to make your eyes standout is to choose colors that contrast. We have listed the different eye colors below with some tips on the best colors to use to enhance your eyes. Blue Eyes – If you want to enhance the look of your blue eyes use shades of purple, pale golds, and also dark, deep browns. When they are used properly, you can create a beautiful, smoky look that is subtle but still eye-catching. Green Eyes – Green eyes look striking when eyeshadow that is yellow beige, light grey, rich, deep purple or dark green. Using these colors will plump up the look of your eyes and they will appear fuller. Brown Eyes – If you really want to make brown eyes stand out, use blues and deep, dark browns. Brown eyes are versatile with almost every color of the eyeshadow palettes. The application of eyeshadow is fairly straightforward unless you are working on creating specific specialized looks. Below we have outlined the basic steps for applying eyeshadow. Following these steps will help you learn to start using eyeshadow if you aren’t currently, or help you learn the foundation to try some terrific looks that you may not have tried before. Use primer on the eye area (lid) which will help prolong the length of time the eyeshadow stays on your eyes. Eyeshadow can fade into nothing as the hours go by, so using a primer will definitely help reduce that fade out that causes you to have to reapply. You can also use a light foundation if the primer doesn’t work well for your skin. The area underneath your brow should always have light shades of eyeshadow. You also want to use lighter shades on the brow bone as well. You can use dark colors on the lid itself. Sweep eyeshadow back and forth across your eyelid and not up and down. Pat the color on to get a deeper and darker, more exotic look. Be sure to wet the end of you eyeshadow brush before you apply the shadow. This will deepen the look of the color and make it pop more. Make sure there is no eyeshadow residue, dust or powder from your eyeshadow application. Eye shadow is one of the main components of makeup. Sometimes it is one of the only things a woman wears. There are a wide variety of eyeshadows on the market that can give you the different colors and looks you are looking for. Whether your favorite colors are the nudes and neutrals or the bright, bold colors, the right eyeshadow palette will open up a whole new world of dramatic and beautiful looks for you.